For other places with the same name, see Antsirabe. The Malagasy name Antsirabe literally means "the place of much salt". The city has the nicknames ville d'eau ('city of water' in French) and visy gasy or le Vichy malgache ('the Malagasy Vichy' in Malagasy and French respectively), referring to the presence of multiple thermal springs in the area. The first Norwegian (Lutheran) missionaries arrived in 1868. Limestone and sulphur were exploited in the area at this time. The city was founded by Norwegian missionary T.G. Rosaas in 1872 as a hill station to serve as a retreat centre because of the much cooler climate. The thermal baths were opened in 1917. In 1886 the Norwegian mission established the leper hospital of Ambohipiantrana and it quickly developed into a village for lepers. The colonial government decided to make it the leper hospital of Vakinankaratra and the around 950 people with the illness lived there in 1904. During the French colonial rule the centre of the Vakinankaratra region shifted from the Andrantsay capital of Fivavahana to Antsirabe. On 1921.01.10 it succeeded Betafó as the seat of a Catholic (pre-diocesan) Apostolic vicariate, promoted to bishopric Antsirabe on 1955.09.14. The population of Antsirabe was estimated at 238,478 in 2013. The majority of the population belongs to the Merina ethnic group, which speaks a highland dialect of Malagasy. As in other urban areas of Madagascar, French is widely understood. A number of Christian denominations are represented in the city. Its Marian Cathédrale Notre-Dame-de-la-Salette is the episcopal see of the Roman Catholic Diocese of Antsirabe. There are also a Lutheran church and two mosques in the city. Traditional Merina cultural practices such as famadihana (second burial) and family tombs are common. Antsirabe is an urban commune or municipality (kaominina). The borders of the commune are identical with those of the Antsirabe I District. Antsirabe is also the capital of the Vakinankaratra region. Since April 2012, the city is governed by a "Special Delegation" with three members: Razafindrainiony Lala Marie Béryl, the previous Head of Antsirabe I District is President of the Special Delegation while Randrianarison Olivier from the TIM party and Rakotomalala Olivier from the AS party are First and Second Deputy presidents, respectively. Between November 2011 and April 2012 the position of the Mayor of Antsirabe was vacant. Olga Ramalason of the TIM party was Mayor until she was appointed Minister of Commerce in Omer Beriziky's government of consensus in November 2011. The city council was elected in November 2003. Several buildings in central Antsirabe date back to the first decades of the 20th century. These include the thermal bath centre (opened in 1917), Hôtel des Thermes (1922), the railway station (1923), and the residence for French retirees (1934). Other sights are la Stèle de l'Indépendance (the Stele of Independence) on Independence Avenue and the two public markets: Antsenakely ("The Small Market") and the bigger Asabotsy. The nearby volcanic lake Tritriva is a popular tourist attraction. Antsirabe is situated at an altitude of about 1,500 m (4,900 ft), making its subtropical highland climate (Köppen: Cwb), similar to brazilian high cities of the southeast. During the winter the temperature can fall below 0 °C (32 °F) at night. May to September form the coldest and driest part of the year with average monthly temperatures between 14 °C (57 °F) and 17 °C (63 °F) and an average number of days with precipitation per month of 1–2. From November to March the climate is warmer and wetter with on average 12 to 17 days with precipitation per month and average temperature of approximately 20 °C (68 °F). April and October have average temperatures of 19.2 °C (66.6 °F) and 18.5 °C (65.3 °F) respectively and 5–6 days of rain. The Ankaratra volcanic field covers an area about 100 km long from Antsirabe northwards to Arivonimamo where highest peak reaches 2,644 m (8,675 ft). This volcanic field is "the most prominent and volcanologically diverse (sic) on Madagascar". Several water-filled craters are found in the area around Antsirabe, including Lake Tritriva to the south-west. There are hot springs which are utilised by the Ranomafana thermal bath in the city. The Mania River is south of Antsirabe. An Export Processing Zone is located in Antsirabe and the town is the home of several factories, including Star Brasseries (beverages), Cotona (textiles) and Kobama (grain). As in Antananarivo, international economic sanctions following the 2009 uprising and following political crisis led to an economic downturn and factory lay-offs in Antsirabe. The removal of Madagascar from the list of beneficiaries of the African Growth and Opportunity Act was particularly important in this regard. The city is at the end of the TA (Tananarive-Antsirabe) railway line, part of the Network North railway, which links Antsirabe to the capital and the port city of Toamasina. The line is operated by Madarail, currently only with freight trains. The line has been extended southwards through Vinaninkarena, but this extension is not in use. National road 7 (RN7) connects the city to Antananarivo in the north and to Fianarantsoa and Toliara to the south. Antsirabe is connected with Morondava on the west coast through RN34/35. Public transport to and from Antsirabe are provided by taxi-brousses (share taxis) and buses. Most taxi-brousses operate from the main bus station in the north of the city. Within the city public transport consists of small buses and numerous pulled rickshaws ("pousse-pousse"), as well as cycle rickshaw ("cyclo-pousse"), auto rickshaw ("touktouks") and private taxis. The pousse-pousse is something of an emblem of the city; 5600 of them were recorded in 2006. There is also an airport. Collège français Jules-Verne, a French international school, is in the commune. ^ a b Institut National de la Statistique, Antananarivo. ^ "Votre voyage à Antsirabe à Madagascar [Your trip to Antsirabe in Madagascar]" (in French). MTTC. Archived from the original on 11 November 2012. Retrieved 14 July 2012. ^ a b c Misy Info. "Site communautaire d'information touristique: Un peu d'histoire". Retrieved 23 December 2011. 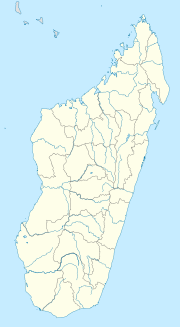 ^ "Diocese of Antsirabé, Madagascar". Gcatholic.org. Retrieved 26 August 2017. ^ a b "Antsirabe: Un administrateur civil à la tête de la mairie" (in French). L'Express de Madagascar. 13 April 2012. Archived from the original on 19 April 2012. Retrieved 14 July 2012. ^ a b "Climate: Antsirabe – Climate graph, Temperature graph, Climate table". Climate-Data.org. Retrieved 1 February 2014. ^ yr.no. "Weather statistics for Antsirabe, Antananarivo (Madagascar)". Archived from the original on 4 November 2013. Retrieved 2 January 2012. ^ "Ankaratra Field". Global Volcanism Program. Retrieved 15 July 2012. ^ Misy Info. "Site communautaire d'information touristique: Venir à Antsirabe". Retrieved 2 January 2012. ^ Misy Info. "Site communautaire d'information touristique: Les Pousse-pousse". Retrieved 2 January 2012. ^ "Collège français Jules-Verne." AEFE. Retrieved on May 4, 2015. ^ "Accueil" (Archive). Collège français Jules-Verne. Retrieved on May 4, 2015. ^ Municipality of Vacoas / Phoenix. "Salient Features of the Town". Archived from the original on 2 July 2013. Retrieved 28 May 2012. ^ "Madagascar: Antsirabe coopère avec Stavanger". Fr.allafrica.com. Retrieved 26 August 2017.